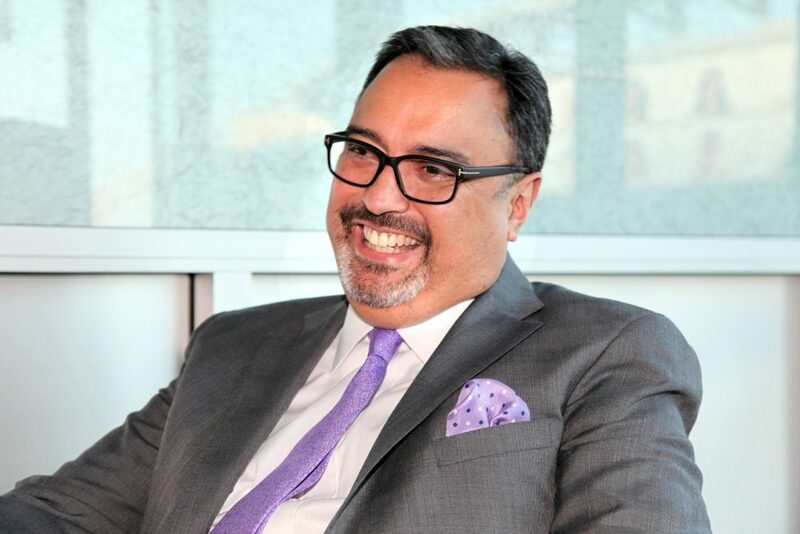 Michael Camuñez is President and CEO of Monarch Global Strategies. He formerly served as Assistant Secretary of Commerce for Trade and Compliance in the Obama administration. Before taking part in a Zócalo/UCLA Anderson event titled “What Will Trump’s Trade Wars Do to the U.S. Economy?” at the National Center for the Preservation of Democracy in downtown Los Angeles, he spoke in the green room about fatherhood, Michelangelo’s sculptures, and Peppa Pig. There are three high school teachers that I’m still in touch with. In fact, one of them just visited us last weekend. And they had very different but similar roles. But in terms of my career in politics, my high school civics and AP history teacher, a guy named Clyde Austin. He was a railroad worker, Vietnam-era, working-class guy who put himself through night school to earn his degree and became a teacher. And I’ve been to Harvard, I’ve been to Stanford, I’ve been to the best institutions in the world, and I would say Clyde is among the best teachers I’ve ever had. He knew how to bring topics to life—the power of democracy, the power of ideas. [Alexander] Hamilton is very in vogue right now, but even before Hamilton there was a certain sexiness to the Founding Fathers, I always thought—the power of their ideas. You’ve lived in a bunch of places. Do you have a favorite? Not really. Washington is a very special place, that nation’s capital, the epicenter of world power, it’s a very multicultural, international city. But I actually love Los Angeles. L.A. is this cauldron of diversity that’s so dynamic. Just tonight, walking through Little Tokyo, it’s remarkable how much is here in Los Angeles. We had lived here before. My husband’s from Los Angeles; I came here to practice law after finishing law school. Warren Christopher was a mentor of mine, and watching his career and how he managed to be a citizen-servant was really inspiring to many of us—I’m not the only one. What are you reading for pleasure right now? What I’ve just ordered and am about to read is Call Me By Your Name. My sister recommended it to me. I like reading the books before seeing the movie, and I’m told that the writing is very powerful…. I’m a big Pat Conroy fan. He has a very powerful way to write about a sense of place, the Carolina marshlands and the South. I’m always nibbling around the edges of a Conroy book that I haven’t read. But I end up reading a lot for work, and with little kids my reading has gone dramatically down. You’re probably reading to them a lot? We are. I can tell you a lot about classic fairy tales, Peppa Pig—new stuff that wasn’t around when I was a kid! What’s been the biggest pleasant surprise about fatherhood? Just the joys that come from watching these little people grow and evolve. Before we were parents we visited Italy. And if you’ve been to Florence, to the Accademia Gallery, where Michelangelo’s David is, they have some Michelangelo works that are incomplete; they’re sculptures that show the sculptures in formation. And I remember being struck by how powerful these incomplete sculptures were, because what they reveal is that the artist is not creating the art, he’s kind of liberating the art. For me, parenting is a lot like that. If you could time-travel to any period, which would you choose? I would want to go to the future, maybe a century ahead, because I want to make sure that this world is OK for my kids. It’s on my mind constantly: What kind of world are they going to grow up in? If I didn’t have kids, I’m a big history buff and I’d like to go back to around the time of the American Revolution and the Enlightenment, and this moment in history when we were casting off the thousand-year reign of kings and queens, and discovering the power of human potential—these big ideas that are still being liberated.